You’ve found the perfect beach destination for your vacation, but now what? Many of our guests truly enjoy throwing down a beach towel or their favorite beach chair and enjoying the mystical sites and sounds of the ocean while resting their toes in the sand. 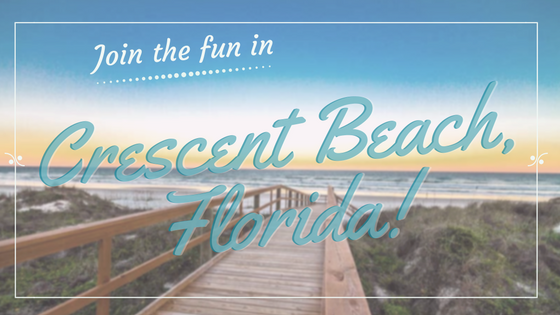 But did you know there’s more to do in Crescent Beach than simply enjoying the view? Collecting seashells on beautiful Crescent Beach never gets old. But did you know you can find more than just seashells. Yesterday a little boy ran up to me with pure excitement in his eyes! He had to tell everyone that he found a baby shark’s tooth. He was overjoyed and wanted everyone to know it. One of my favorite items to find on the beach are sand dollars, but not just any sand dollar, but the big puffy ones, AKA Sea biscuits. These are rare to find in their whole state, so when I find one, I feel like I won the lottery! I personally don’t surf, but I love to watch these athletic artists carve up waves either as a storm is brewing or when the surf is up after we had a storm roll out of town. Here is a special note, if you see the surfers out, it’s usually wise to stay out of the water unless you are a strong swimmer. The surf can get a little choppy and rip tides are favorable. A few days ago a guest told me that “floating” is the cure to all woes! I had to think about that for a minute and then she explained. She loves to get either her tube or raft and just relax in the water as the waves gently rock her back and forth. She said the sounds of the ocean are better than any relaxation CD you can buy. I have to admit, just floating is very relaxing and everyone should try it now and then. Word of caution, don’t fall asleep and ensure you have a buddy on land that is watching you and making sure your don’t float out too far. No matter what your age might be, building anything in the sand is always loads of fun!! You don’t have to be an architect and build an extravagant structure, you can do other fun things in the sand as well. Have you ever just dug a hole in the sand and then jumped in it to see how far you could dig before water came in from the bottom? How about building a tunnel? This was an all time favorite of mine as a child! The best fun in the sand I have seen yet was a grandmother with her three grandchildren buring half of her in the sand. She said they were making her look like a mermaid and the sand became her tail. This overjoyed grandma said it was one of the most fun activities she had done with them in a while. As a native of beautiful St. Augustine, there is something magical about gliding along the Matanzas River and enjoying the sites. The Matanzas River is on the other side of our little island and is something you should take a moment to see. We have had a few guests ask if this was the bay, and were sometimes shocked to learn it was an actual river. The river offers many things that Crescent Beach does like boating, tubing and yes, SUPing. No matter how many times I see the dolphins make their journey either off of Crescent beach or in the Matanzas River, I still get excited to see them. Occasionally you can catch them playing and putting on a small show for you. Their show of acrobatics is a rare sighting, but it does happen! The best thing about skimboarding is the fact that you can do this any day of the week and during any time of year. You don’t have to wait for the surf to be up like surfing and boogie boarding, all you need is the board and some skills. I have seen many folks that wipe out and I am sure if I tried I would be one of them as well. Skimboarding is simply getting your skimboard to glide across the water as the water washes up the shore. If you are really good you can do a little trick as the waves crash upon the beach. These are just a few activities that I, as well as some of our guests, have enjoyed when visiting beautiful Crescent Beach. I hope you have a chance to enjoy some of these adventures as well.